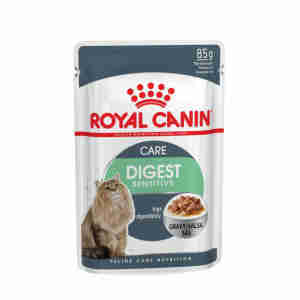 Royal Canin Digest Sensitive in Gravy provides a diet that is highly digestible for cats that sometimes have sensitive stomachs, it also contains specially selected nutrients that help to reduce your cat’s faecal odour. The high rate of digestibility provided by Royal Canin Digest Sensitive in Gravy will ensure that your cat receives more of the nutrients it needs. The low fat content in this diet can also contribute to maintaining an ideal, healthy weight. The protein included is at an optimal level to support muscle and bone strength whilst still maintaining digestive health in your cat’s sensitive tummy. It will also ensure that when your cat does its business, the odour won’t be distractingly strong – which in itself is a sign of good digestive health. This diet also helps support a health urinary traction through an optimal, reduced concentration of minerals. To cater to even the fussiest of cats digestive care is also avaible in a dry mix, make sure to follow the Royal Canin feeding guidelines when mixing dry and wet for optimal health benefit. I feed this to Maxwell, my elderly rescue cat with very few teeth, who lives indoors. It is ideal for him as it is soft and moist so he can eat it easily,. It also makes his poo considerably less smelly, which is nice for me! The pouches are just great & my cat has not had to go back to the vets now that he's able to eat this food.